The Works with Sonos badge certifies products that seamlessly connect with the Sonos Home Sound System. Today's homes utilize a wide range of connected technologies. We expect to be able to listen to our favorite songs, podcasts, and radio stations everywhere we go in our homes. We also expect our devices and music services to work together like magic. Our Works with Sonos program certifies products that seamlessly connect with the Sonos Home Sound System. The badge helps you answer the question, “Will this work with my Sonos?” The badge helps people choose products that meet Sonos’ exacting standards for design and sound. Look for this symbol in stores, on packaging and online. Get direct, one-touch control of any Sonos speaker as well as control of lighting, blinds and central heating with Sonos’ integration into Lutron’s Caséta Wireless, RA2 Select, RadioRA 2, and HomeWorks QS smart home systems. Play, pause, skip tracks and adjust volume in exactly the same way that you control lights and blinds from your bedside table or from the wall. KNX is the most reliable worldwide standard for home and building automation. Feel and enjoy the power of your Schneider Electric KNX Home Automation Solution with Sonos Sound. Schneider Electric has released a Schneider Electric Sonos Application that seamlessly integrates with our Wiser for KNX IoT controller: take a bold step into the IoT future. Comfort, flexibility, cost efficiency, safety, and security are what modern building technologies are about. Schneider Electric believes that contemporary building control must be easy and intelligent to be useful. Light control, blind and shutter control, HVAC control—smart metering requires many different technologies and products which integrate and solve challenges presented by rapidly-evolving technologies. Together with Wiser for KNX, spaceLYnk or fellerLYnk logic controllers, overcoming these challenges is easy. Add instant buttons and control any Sonos device with iPort’s xPRESS Audio Keypad for Sonos. Toggle through Sonos favourites, control volume, skip tracks and much more. Set up in no more than two minutes with the iPort App via your home’s Wi-Fi network. Mount on the wall or anywhere else with built-in magnets. TunesMap aims to help you explore, inhabit, and dive deeper into the cultural context of your music. Choose any song playing on your Sonos system and TunesMap makes up an interactive documentary of films, art, fashion, books, photos, articles, videos, and merchandise from the artist you’re listening to - and displays it instantly via your Apple TV. Alarms.com’s partnership with Sonos adds seamless smart home control for music and audio content. With a single tap on the Alarm.com app, a Scene for arriving home can disarm the security system, unlock the front door, turn on the living room lights and start off a favourite playlist through Sonos. Lights. Power. Security. And Sonos. Now they’re all connected through one single app. Simple controls enable you to monitor and manage everything in your home. You have less to do, as it does more for you. Yonomi brings your home to life. Automate your Sonos system or link it up with other smart home devices to create the perfect atmosphere for every room at any time of day. Yonomi works flawlessly with all your favourite devices, like Nest, Philips Hue, LIFX, Ecobee, Lutron, and more. ABB-free@home – Home automation easier than ever. Switching or dimming the light, heating or cooling, controlling the blinds and the Sonos speaker. Everything is integrated in one system. Designed to match your light switches and sockets, the system allows you to control your Sonos system with a touch of a button. With ABB-free@home you are able to automate your smart house in the way that like: e.g. your blinds roll up automatically in the morning or your favourite song plays on your Sonos system to wake you up. Leaving the house? You can program the system so that all lights turn off and the music stops when you leave. The new URC module allows for simple and reliable Sonos control as part of a fully-integrated Total Control 2.0 system. Features include; volume control, grouping of Sonos players, access to Sonos favourites and advanced automation. The module utilises a new method of integration that expedites the programming process for URC dealers. The awesome home theatre you’ve built around your Onkyo receiver can now be part of your existing Sonos Home Sound System, or the start of a new one. After a simple setup, your Onkyo receiver will seamlessly tie into Sonos, instantly waking, changing inputs and playing at the volume you command through the familiar Sonos app. Control of music is now as simple as operating a light switch! Play your favourite music on Sonos in any room from the same switch that operates your lighting, curtains, and blinds. Seamless control of a Sonos Home Sound System, without the hassle. 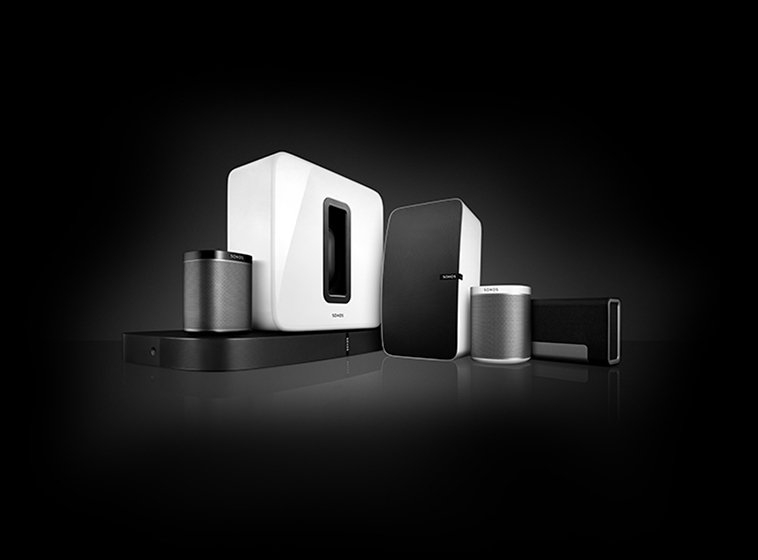 Instantly upgrade the music streaming capability and enjoyment of select Elite home theatre components with Sonos Connect. With the do-it-all Sonos app for control, access to endless audio and seamless component waking, you’ll effortlessly bring Elite performance to your Sonos Home Sound System. After a simple set up, your receiver will seamlessly tie into Sonos, instantly waking, changing inputs and playing at the volume you command through the familiar Sonos app. Custom installers, and those who desire the pinnacle of performance, place Integra a/v receivers and processors at the heart of their home theatre. 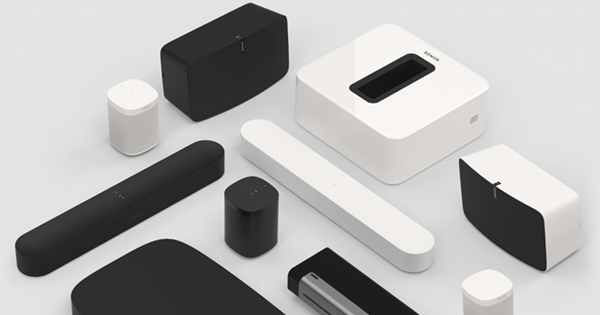 Now select Integra components can perfectly integrate into an existing Sonos Home Sound System, or be the foundation of a new system, through the addition of a Sonos Connect. Following a quick set up, the compatible Integra component will seamlessly tie into Sonos, instantly waking, changing inputs and playing at the volume input through the familiar Sonos app or control system. Bringing refined design together with the best in audio technology, the Wrensilva x Sonos consoles are an elegant fusion of the past and the future. Traditional craftsmanship, heirloom quality materials, and analogue audio find harmony with contemporary design sensibility, intuitive user interfaces, and the absolute cutting-edge of audio streaming by Sonos. We are actively seeking new partners to integrate with and explore the possibilities of the connected sonic culture.